Last Thursday, the US entered its longest bull market in history. 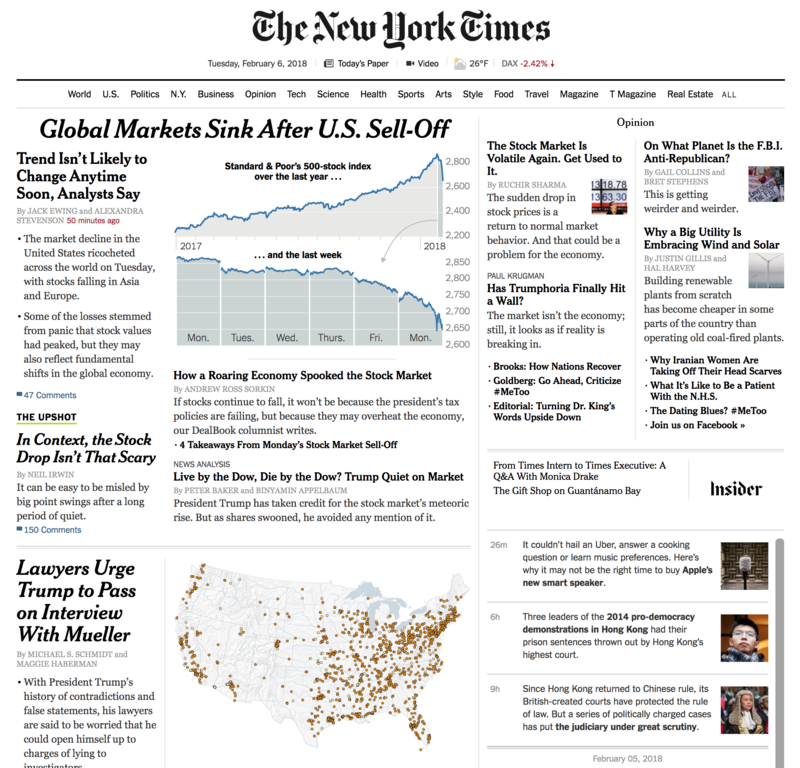 And the New York Times covered the story on the front page, which makes this another episode of covering graphics when they land on the Times’ front page. 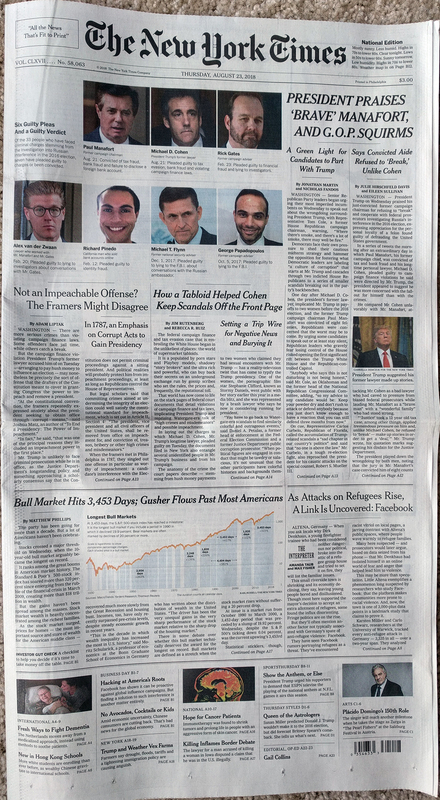 Of course, last week was a big news week away from the economy and so it is no surprise that the above-the-fold coverage was on the scandals besetting the president and those of his team who have pleaded guilty or been convicted of crimes by juries. 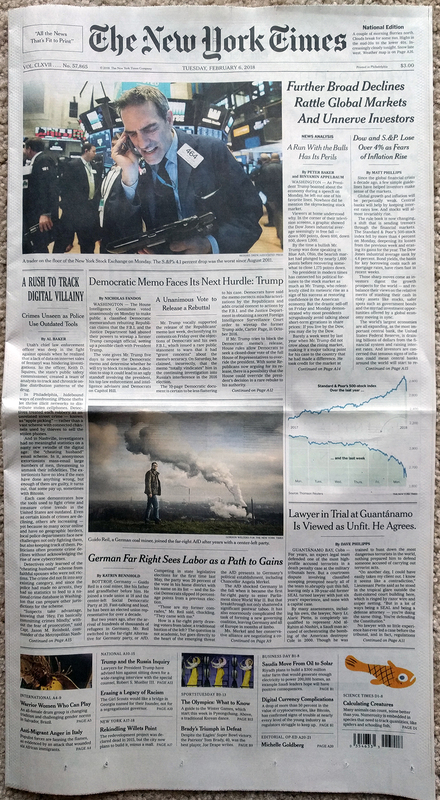 But you will note that below the fold is that nice little graphic. Here we see it in more detail. 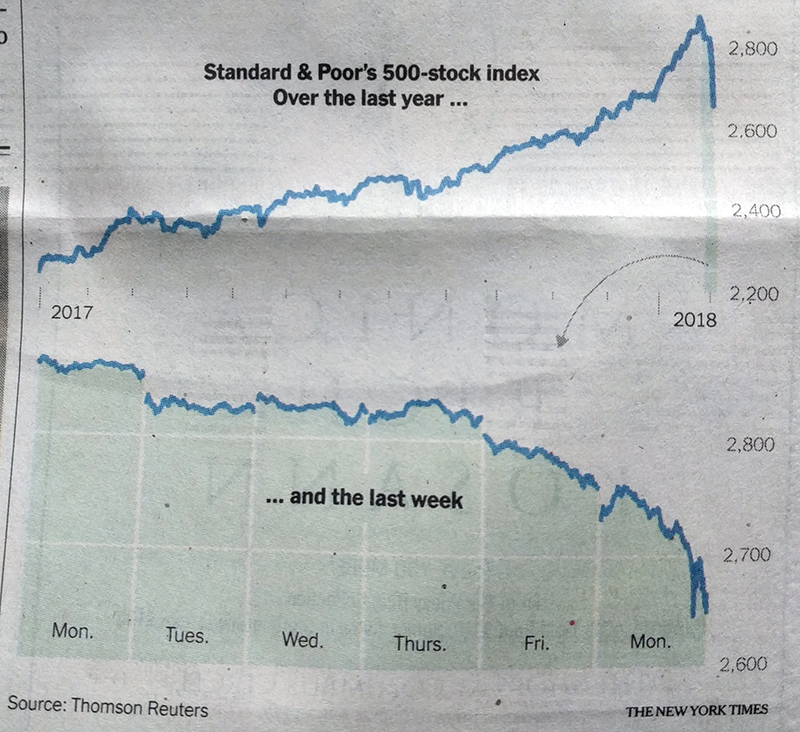 What I like about the graphic is how it uses the blue fill to draw attention to the bull markets but then also labels how long each was. Those keen on the story will note there is a debate whether a particular 19.9% drop qualifies for the 20% drop usually used to benchmark the beginning and ending of a bull market. That is why there is that second label with the black arrows on the graphic. It also uses the negative space created by the shape of the graphic to contain its title, text, and caption information. Credit for the piece goes to Karl Russell. 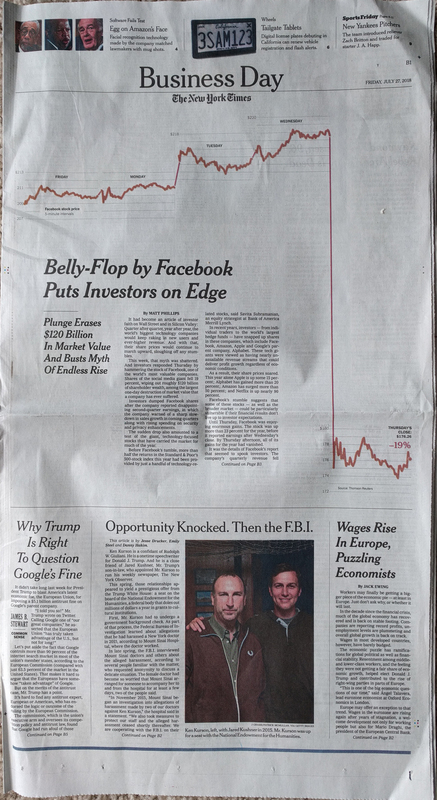 Last Tuesday we looked at a print piece from the New York Times detailing the share price plunge of Facebook after the company revealed how recent scandals and negative news impacted its financials. Well, today we have a piece from last week that shows how large Apple is after it hit a market capitalisation of one trillion US dollars. The piece itself is not big on the data visualisation, but it functions much like the Facebook piece, as a blend of editorial design and data visualisation. 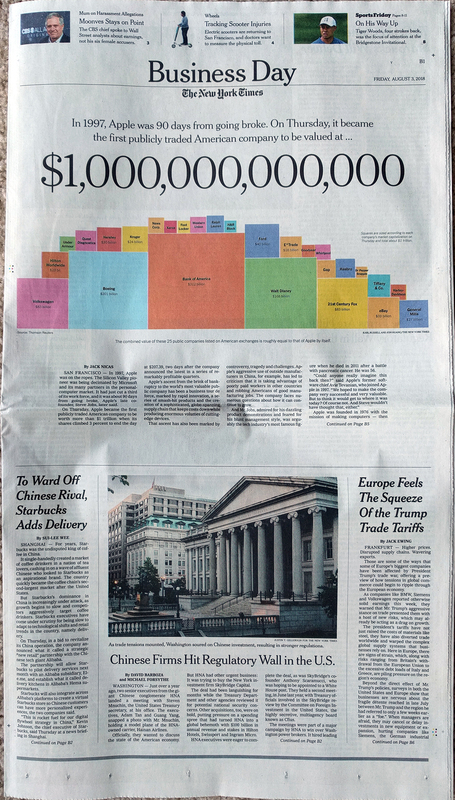 The graphic falls entirely above the fold and combines a factette and maybe we could classify it as a deconstructed tree map. It uses squares where, presumably, the area equates to the company’s value. And the sum total of those squares equals that of one trillion dollars, or the value of Apple. In terms of design it does it well. The factette is large enough to just about stretch across the width of the page and so matches the graphic below it in its array of colours. Why the colours? I believe these are purely aesthetic. After all, it is unclear to me just what Ford, Hasbro, and General Mills all have in common. In a more straight data visualisation piece, we might see colour used to classify companies by industry, by growth in share price or market share. Here, however, colour functions in the editorial space to grab the reader’s attention. 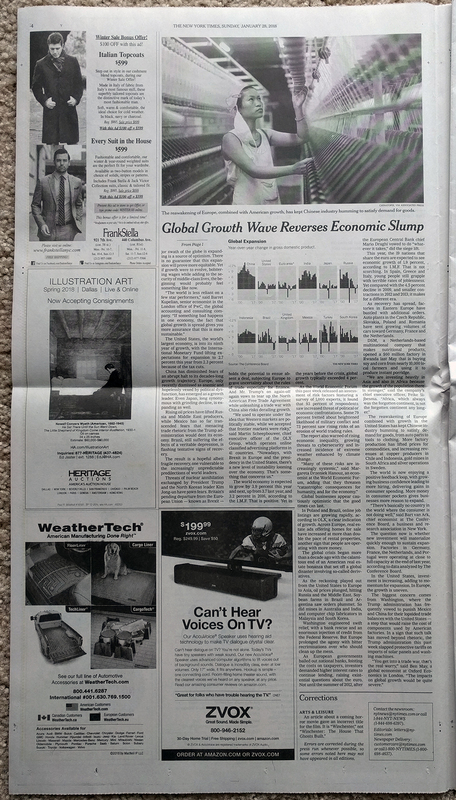 The design also makes use of white space surrounding the text, much like the Facebook piece last week, to quiet the overall space above the fold and focus the reader’s attention on the story. 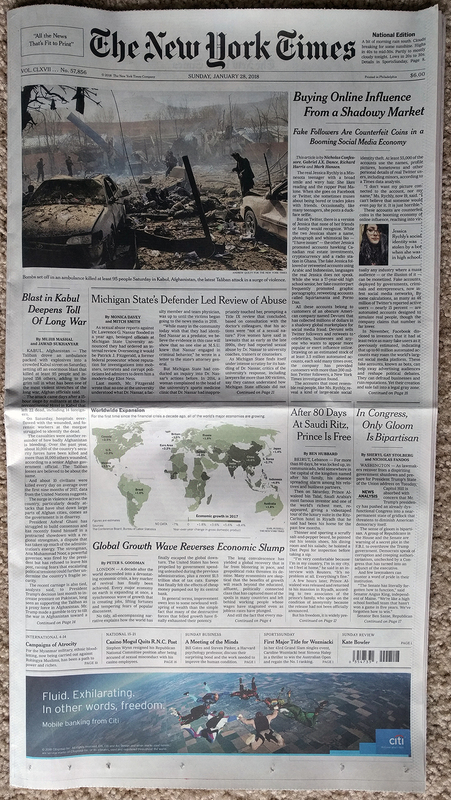 Note that the usual layout of stories on the page continues, but only after the fold. When we keep in mind the function of the piece, i.e. it is not a straight-up-explore-the-data type of piece, we can appreciate how well it functions. All in all this was a really nice treat last Friday morning. Credit for the piece goes to Karl Russell and Jon Huang. Last Thursday, Facebook’s share price plunged on the news of some not so great numbers from the company on its quarterly earnings report. The data and number itself is not terribly surprising—it is a line chart. But what I loved is how the New York Times handled this on the front of the Business section on Friday morning. I found the layout of the page and that article striking. In particular, each day of the share price is almost self-contained in that the axis lines start and stop for each day. I question the thickness of the stroke as something a little thinner might have been a bit clearer on the data. However, it might also have not been strong enough to carry the attention at the top of the page. As it is, that attention is needed to draw the reader down the page and then down across the fold. Additionally, the designers were sensitive to the need to draw that attention down the page. In order to do that they kept the white space around the graphic and kept the text to two small blocks before moving on to the interior of the section. Credit for the story goes to Matthew Philips. Although I’m pretty sure the page layout goes to somebody else. Friday night the US, UK, and France struck targets in Syria that play a role in the chemical weapons programme of the Bashir al-Assad regime. This is despite “eliminating” his chemical weapons several years ago. And so not surprisingly the media this past weekend covered Syria and the airstrikes. This print piece from the New York Times, however, looked backwards at the history of the chemical attacks Syria has unleashed against its own people. On a side note, I wanted to point the editorial design here. The overall page is quite nice. The map falls squarely within the middle of the article, with a nice gallery of photographs running along the top. 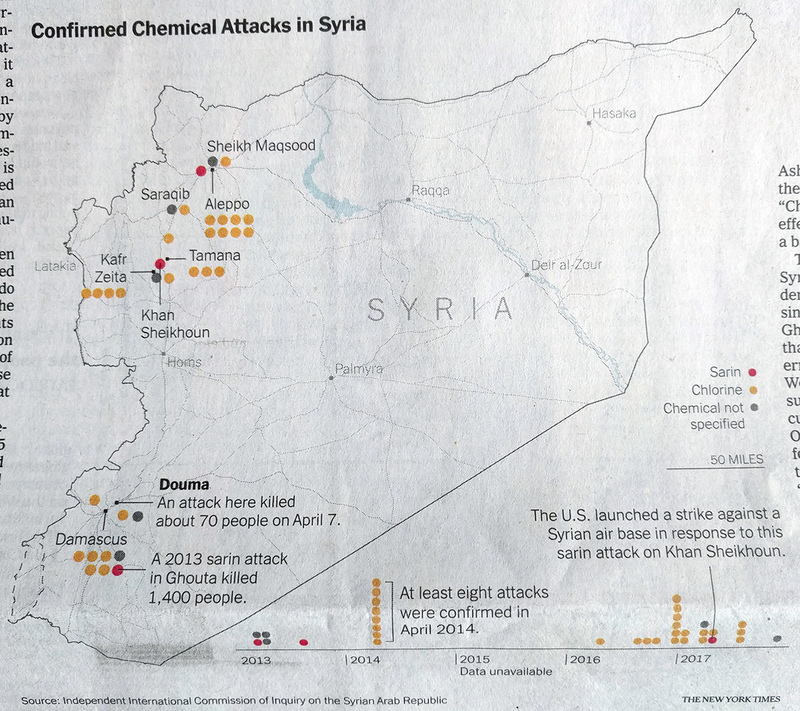 It also features a devastating pull quote describing the Syrian government’s use of chemical weapons. 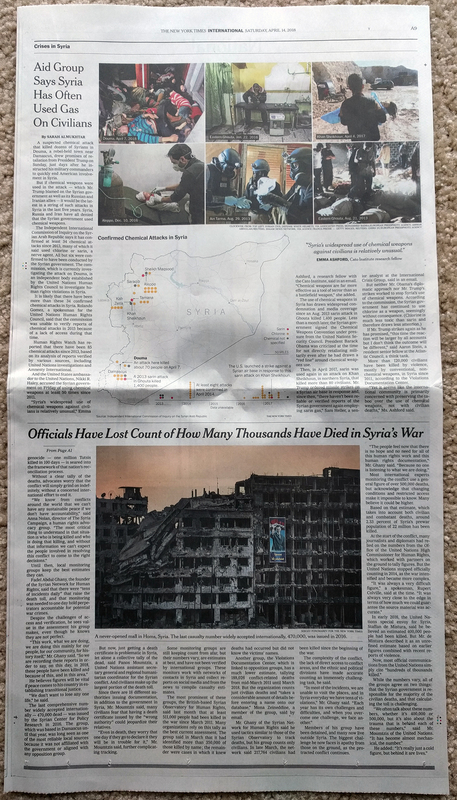 The article fits almost entirely above not just the fold, but also another terrible line of text, in this case the title of another article: Officials Have Lost Count of How Many Thousands Have Died in Syria’s War. Overall, this was a solid piece providing a backdrop and historical context for the news. 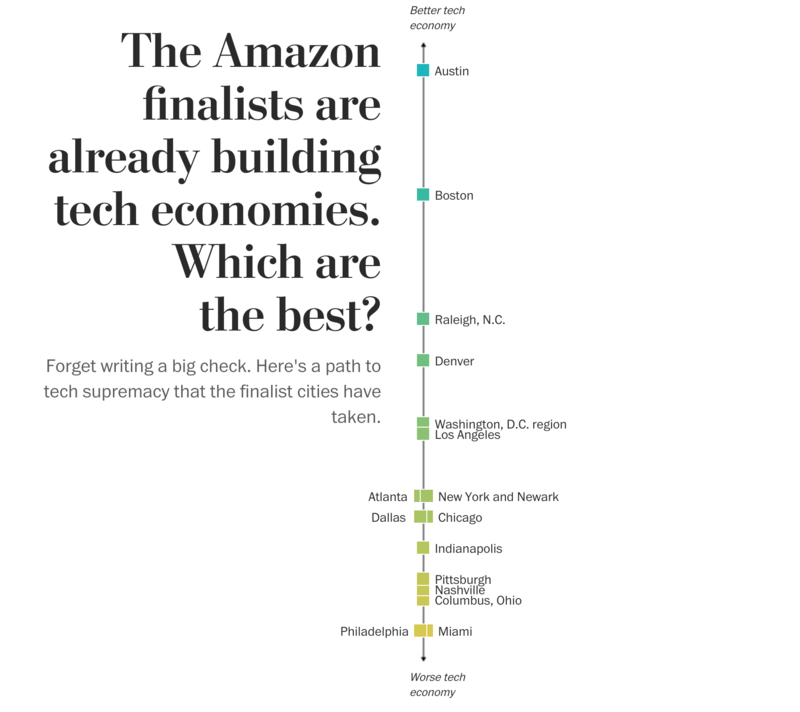 Earlier this March the Washington Post published a piece looking at the twenty finalist contenders for the second Amazon headquarters. Specifically it explored how the cities rank in metrics that speak to a city’s technology and innovation economy. That in and of itself, while incredibly fascinating, is not noteworthy in and of itself. Though I will say the article’s online title is neatly presented, split half-and-half with the vertical graphic showing the cities ranked. I really like how this title space received a special design. But the point that was really neat was the interactivity that followed. 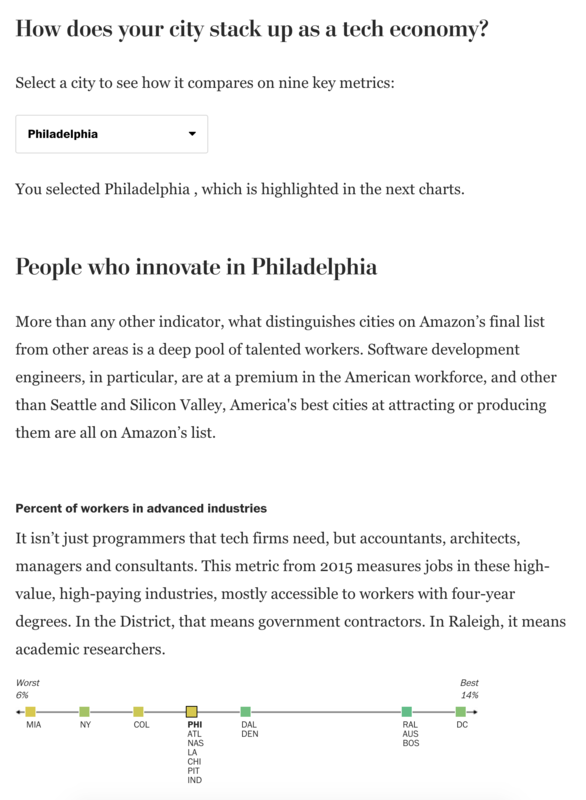 Here you can see a dropdown from which the user selects a city of interest—surprise, surprise we are looking at Philadelphia. From that point on, the piece keeps the selected city highlighted in every graphic that follows. Again, that is nothing truly surprising, but it is neat to see. What would have taken it to the next step is if each of those associated paragraphs were tailored to the specific city. Instead, they appear to be general paragraphs. But overall, it does a really nice job of comparing the twenty cities—it’s actually fewer because both Washington and New York have multiple sites per metro area—across the different metrics. The only part that left me scratching my head a bit was the colour choice. I am not certain that it needs the blue-green to yellow-green palette. Those colours seem defined by a city’s placement on the overall list and I am not convinced that the piece would not have still worked if they had been only a single colour, using another colour to define the selected city. Credit for the piece goes to Darla Cameron and Jonathan O’Connell. This past Sunday I had a nice treat in the New York Times. 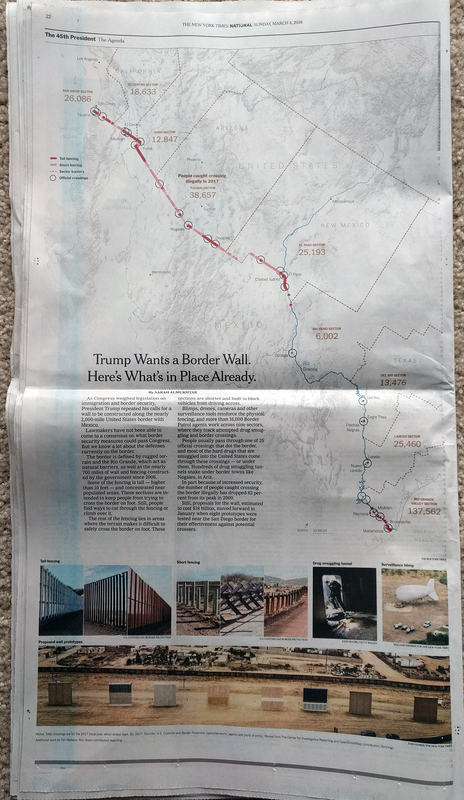 They printed a piece looking at the state of the US-Mexican border wall as it is today. And not only was it an article, but it was a full-page article. There isn’t a lot to say about it in particular. But what I really did like was the decision by the designer to tilt the map at an angle. Normally we would see a straight east-to-west, right-to-left map, but here the axis is more southeast-to-northwest, right-to-left map. And that creates a nice space for text in the lower left area, which the designer here did in fact use for the main block of text. Credit for the piece goes to Sarah Almukhtar. Europe enjoyed some significant political news yesterday. First, Angela Merkel will serve a fourth term as chancellor as the SPD members voted to allow their party to enter into a grand coalition with Merkel’s CDU/CSU party. 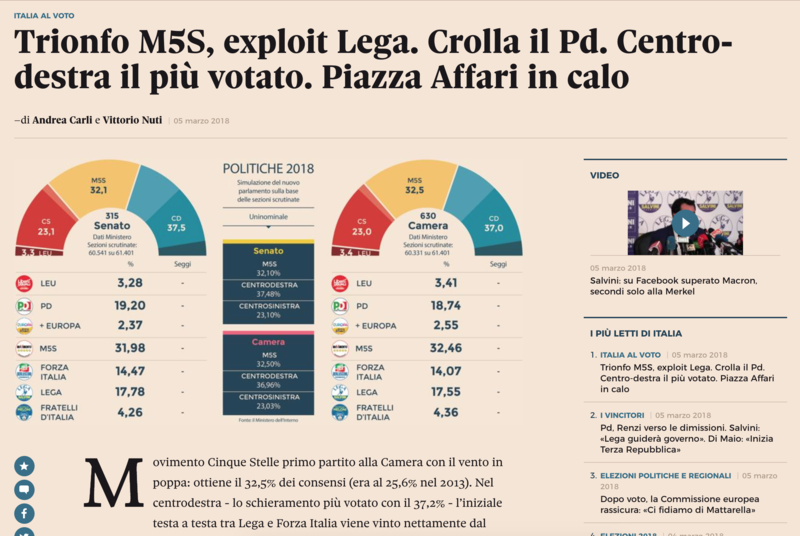 But the more important story is that of the Italian elections, where the centre-left under Matteo Renzi was attempting a comeback against the populist parties the 5-Star Movement and the League, the latter an anti-immigrant party. Also in the mix was Silvio Berlusconi, whose Forza party won 14% of the vote and as a member of a right/centre-right bloc that won 37%. 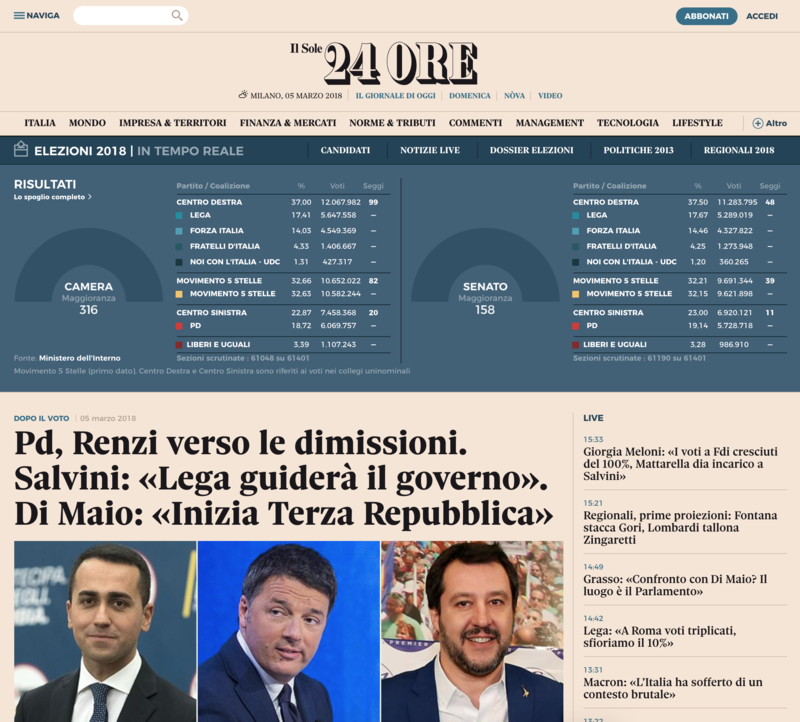 So I chose to highlight the homepage of IL Sore 24 Ore, an Italian newspaper, that had the results displayed clearly. Of course the big problem is that I can neither read nor speak Italian. So figuring out just what every label is proved to be a bit tricky. But once you figure it out, it is quite clear. The nice blue banner for the real-time results (again with the assuming of translation) does a nice job of clearly separating itself from the rest of the page, but the tables inside are quiet and not screaming for attention. Instead the user is allowed to find his or her party of bloc of interest and then scan to the right for the bold number of seats in the respective chamber. The results page is similarly nice, using clean and simple tables to organise the information. Using the Chamber of Deputies page as an example, the overall results appear on the left while important context via maps and specific regions appear to the right. All the while the use of simple typography and whitespace guide the user to the appropriate data set. And lastly a screenshot of an article about the election results, none of which I can read. Here, instead of an interactive table or graphic, we have a static graphic showing the results. It certainly captures the results in this particular moment—exact seat numbers have not yet been released—but could grow stale as the day goes on. 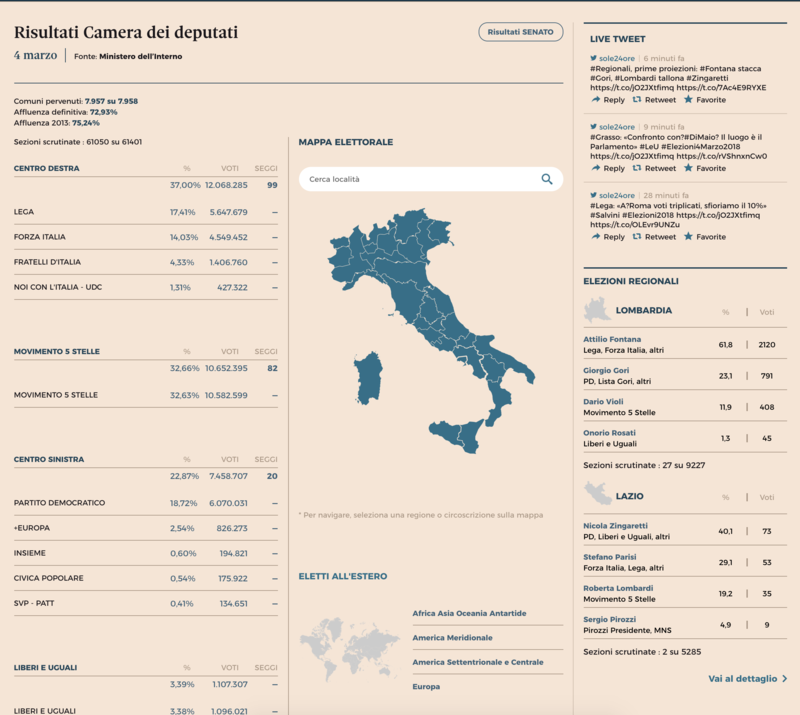 Although there very well could be a page with interactive results like this, but that I cannot find because, again, I cannot read Italian. Overall, the designers did a fantastic job of presenting the data and information, so well that a non-Italian could even figure it out. Credit for the piece goes to the Il Sore 24 Ore graphics department. Today’s piece isn’t strictly about data visualisation. Instead it’s a nice article from the BBC that explores the nascent industry of undersea mining. What caught my interest was the story of Soviet submarine K-129, which sank mysteriously in the middle of the Pacific. But that isn’t even half the story, so if you are interested go and read the article for that bit. But that sinking may have created the beginning of the undersea mining industry. And so as I read on, I found a nice mixture of text, photography, and graphics explaining processes and such. 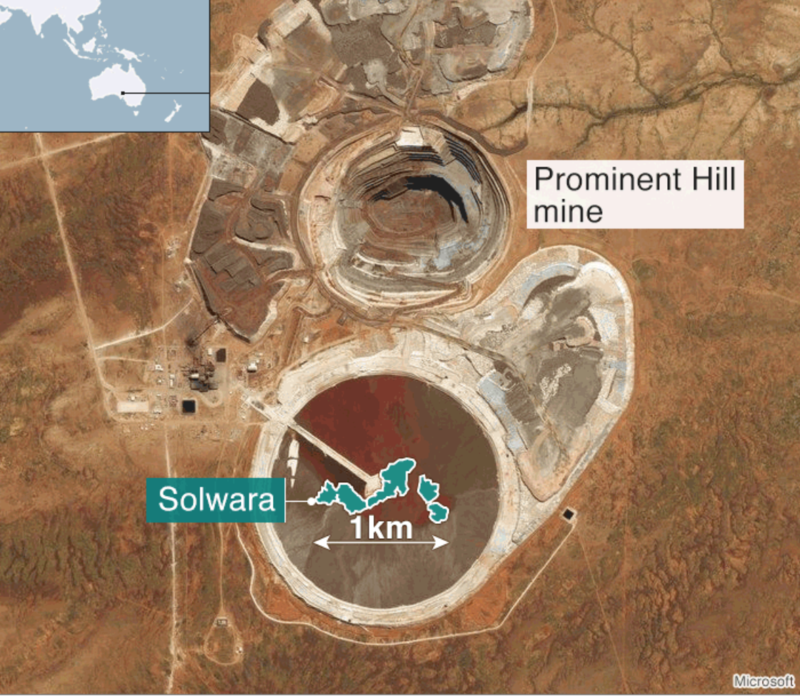 This screenshot is a comparison of the size of an undersea mining zone compared to a land-based copper mine. Some of the graphics could use some polish and finesse, but I do appreciate the effort that goes into creating pieces like this. You will note that four different people had to work together to get the piece online. But if this is perhaps the future of BBC content, this is a great start. Credit for the piece goes to David Shukman, Ben Milne, Zoe Barthlomew, and Finlo Rohrer. One week ago today, President Trump touted soaring stock prices as an indicator of a roaring economy. In truth, stock market prices are not that. They are driven by fundamentals, such as GDP growth, wage increases, and inflation. Furthermore stock prices can be fickle and volatile. Whereas a recession does not begin overnight, the factors build over a period of time, a stock market correction can happen in a single day. So one week hence, the stock market has seen fully one-third of its gains over the past year wiped out. That is over $1 trillion gone from market funds, 401ks, college saving funds, &c. But again, not to freak people out, these things can and do happen. But because they can and do happen, presidents do not often go touting the stock market as it can come back and bite them. 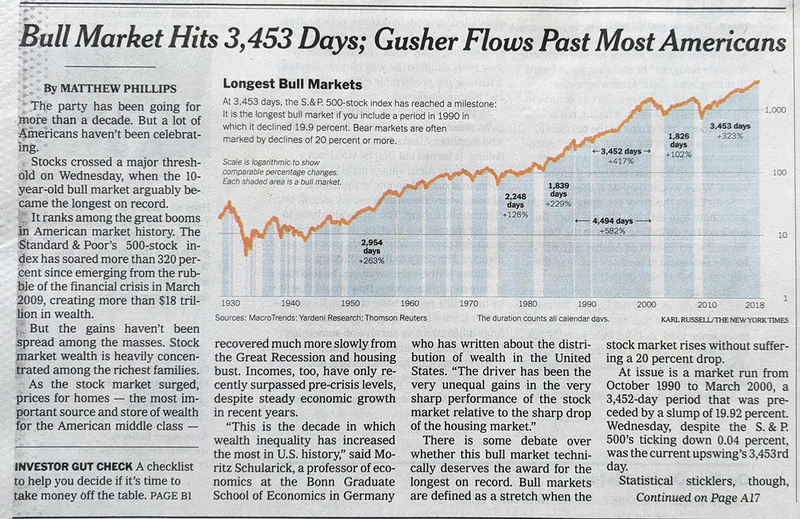 This morning’s paper therefore had a pleasant graphic to accompany a story about the recent declines. And it was on the front page. Like with the choropleth story I covered a little over a week ago, the graphic in today’s paper was not revolutionary nor earth shattering. It was two line charts as one graphic. What was neat, however, was how it supported two different articles. But when I looked closer I found what was really neat: context. The chart does a great job of showing that context of adding nearly $8 trillion in value over the course of the administration. But then that sharp decline at the right-side of the chart is blown out into its own detail to show how all was steady until Friday’s economic news was released. I think perhaps the only drawback is how tiny and fragile that arrow feels. I wonder if something a little bolder would better draw the eye or connect the dots between the two charts. Maybe even moving the “… and the last week” line above the chart line would work. Anyway, I was just curious to see how the charts were depicted on the web. And then lo and behold I was treated to two graphics on the home page. The other is for an article about flood risks to chemical plants, not part of this post. But the focus of our post on the stock market was the same as in print. But here is the homepage with two different graphics, always a treat for a designer like myself. Earlier this month I wrote-up a piece from the Economist that looked at 2018 GDP growth globally. I admitted then—and still do now—that it was an oddly sentimental piece given the frequency with which I made graphics just like that in my designer days of youth and yore. Today, we have the redux, a piece from the New York Times. Again, nothing fancy here. As you will see, we are talking about a choropleth map and bar charts in small multiple format. But why am I highlighting it? Front page news. Choropleth on the front page? More please. I just like seeing this kind of simple, but effective data visualisation work on the front page of a leading newspaper. 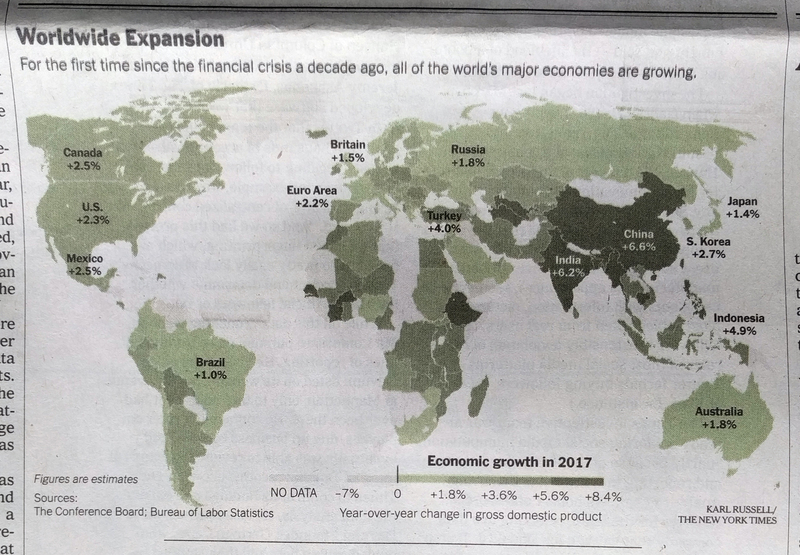 I personally would have used a slightly different palette to give a bit more hint to the few negative growth countries in the world—here’s lookin’ at you, Venezuela—but overall it works. And the break points in the bin seem a bit arbitrary unless they were chosen to specifically highlight the called-out countries. Then on the inside we get another small but effective graphic. It doesn’t consume the whole page, but sits quietly but importantly at the top of the article. 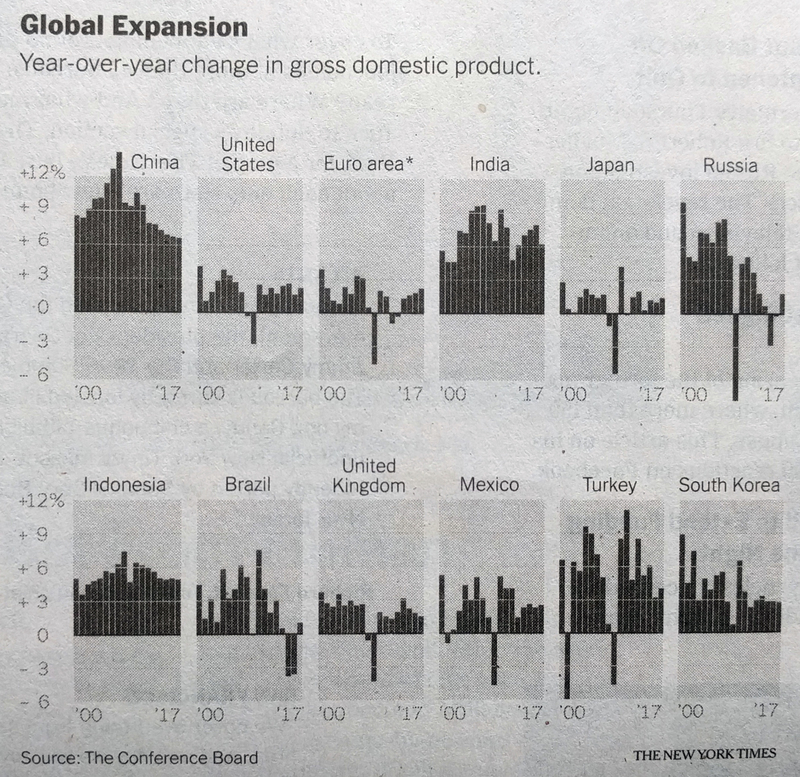 There the small multiples show the year-on-year change—nothing fancy—for the world’s leading economies. A one-colour print, it works well. But, I particularly enjoy the bit with China. Look at how the extreme growth before the Great Recession is handled, just breaking out of the container. Because it isn’t important to read growth as 13.27% (or whatever it was), just that it was extremely high. You could almost say, off the charts. Overall, it was just a fun read for a Sunday morning. Credit for the piece goes to Karl Russell and the New York Times graphics department.